Sony E PZ 18-105mm F4 G OSS E-Mount Zoom lens - Nearly New - Warranty! Sony E PZ 18-105mm F4 G OSS E-Mount Zoom lens in great condition! Tack sharp 4K video on my a6500 and I'm really sad to see it go! I'm a bit of a light traveller and 2-3 lenses is my limit, otherwise I would keep this! 5 out of 5 stars - Sony E PZ 18-105mm F4 G OSS E-Mount Zoom lens - Nearly New - Warranty! 8 product ratings8 product ratings - Sony E PZ 18-105mm F4 G OSS E-Mount Zoom lens - Nearly New - Warranty! Trending at $541.38eBay determines this price through a machine learned model of the product's sale prices within the last 90 days. Trending at $430.86eBay determines this price through a machine learned model of the product's sale prices within the last 90 days. Review Sony. Focal Length 18 to 105mm (35mm Equivalent Focal Length: 27 to 157.5mm). Focus Type Autofocus. Lens Mount Sony E. ALC-SH128 Lens Hood tewxbarwwb. ALC-F72S 72mm Front Lens Cap. ALC-R1EM Rear Lens Cap. The electrically-driven zoom ensures smooth, silent operation for capturing both stills and movies. Autofocus motor Yes. Lens Type Zoom Wideangle. Lens mount Sony E. Size 78 x 110 mm. Minimum aperture 22. Sony E PZ 18-105mm f/4 G OSS Lens. Sony E-Mount. ALC-SH128 Lens Hood. Typographical Policy: We are not responsible for typographical or pricing errors. No Exceptions. - New Arrivals. Add to Favourites. 5 out of 5 stars - Sony E PZ 18-105mm f/4 G OSS Lens BRAND NEW!! 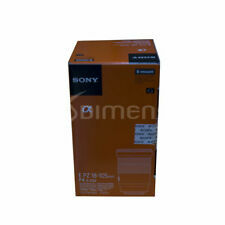 126 product ratings126 product ratings - Sony E PZ 18-105mm f/4 G OSS Lens BRAND NEW!! The lens benefits from an internal focus design that ensures that the overall length of the lens does not change during focusing. Camcorder Kits (Body \ Lens). The product may or may not include the original manual, but access to an English product manual is available via the internet. 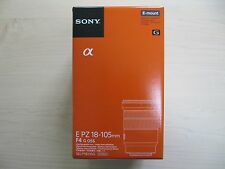 Sony Alpha E-Mount 18-105mm f/4.0 OSS PZ Zoom Lens. Sony Alpha E-Mount 18-105mm f/4.0 OSS PZ Zoom Lens with Similar to Handycam camcorders, a zoom lever on the side of the lens allows both variable and fixed-speed power zooming. SONY E PZ 18-105mm F4 G OSS SELP18105G Lens. Contribute to worldwide photography ! Lens Mount Type : Sony E-mount. Lens Type : Sony E-mount. Focus System : Power Zoom Optics/Lens. : 3-1/8" x 4-3/8" (78 x 110 mm). Built-in Optical Steady Shot image stabilization can significantly reduce image blur. Lense Converters. Front Lens Cap, Rear Lens Cap. we make it unprecedented. Isn't it too easy?. We will work with you until you are satisfied. Sony E PZ 18-105mm f/4 G OSS Len!! EVERYTHING YOU NEED BUNDLE!! Sony E PZ 18-105mm f/4 G OSS Len! EVERYTHING YOU NEED BUNDLE! Sony E PZ 18-105mm f/4 G OSS Lens. • Increases the contrast and saturation in blue skies and white clouds. Constant f/4 maximum aperture enables greater consistency throughout the zoom range and benefits working in dim conditions with longer focal lengths. 5 out of 5 stars - Sony E PZ 18-105mm f/4 G OSS Len!! EVERYTHING YOU NEED BUNDLE!! 126 product ratings126 product ratings - Sony E PZ 18-105mm f/4 G OSS Len!! EVERYTHING YOU NEED BUNDLE!! 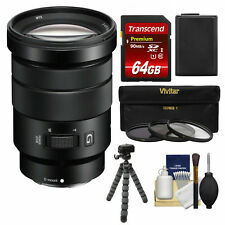 Sony Alpha E-Mount 18-105mm f/4.0 OSS PZ Zoom Lens with 64GB Card Battery Flex Tripod 3 UV/CPL/ND8 Filters Accessory Kit. Sony Alpha E-Mount 18-105mm f/4.0 OSS PZ Zoom Lens. Sony Alpha E-Mount 18-105mm f/4.0 OSS PZ Zoom Lens with. 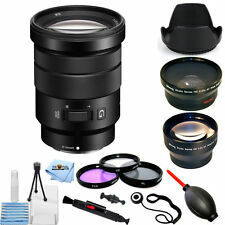 Sony Alpha E-Mount 18-105mm f/4.0 OSS PZ Zoom Lens with Battery Tripod 3 UV/CPL/ND8 Filters Accessory Kit. Sony Alpha E-Mount 18-105mm f/4.0 OSS PZ Zoom Lens. Sony Alpha E-Mount 18-105mm f/4.0 OSS PZ Zoom Lens with. Model: E PZ 18-105mm F4 G OSS SELP18105G. Brightness: F4. Accessories: lens front cap, lens rear cap. Lens construction: 16 sheets group 12. Corresponding mount: Sony E. Japan Usage Item. Release date: December 13, 2013. E PZ 18 - 105 mm F 4 G OSS. Lens mount. Sony E Mount. Lens specification. twenty two. Lens construction (group - sheet). 78 mm x 110 mm. Lens front cap. Lens type Zoom lens. ※ E mount lens (for Sony mirrorless single lens reflex). Lens mount Sony E. Focal length (wide angle side) 18 mm. F value (wide angle side) 4 mm. type Standard lens. Motor type DC motor. We will provide best service! New Arrivals. Weight: about 427g. 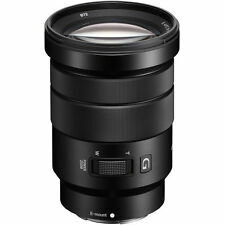 SONY SELP18105G E PZ 18-105mm F4 G OSS. FunctionAll function works well. IncludingFront Lens Cap & Rear Lens Cap & Lens Hood & Original box. Also, we have a national qualification dealing with second hand goods in Japan.